Wright State’s Deri Corfe moves the ball down the field. Corfe scored the winning goal in double overtime, Sept. 8 at Northern Kentucky University. 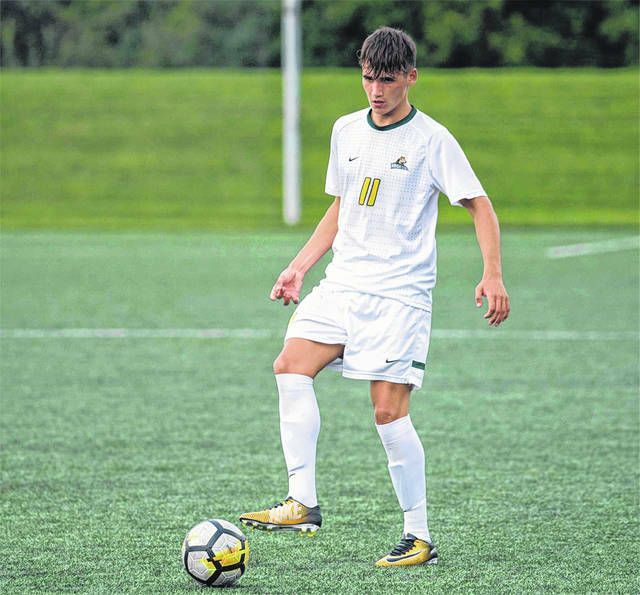 HIGHLAND HEIGHTS, Ky. — The Wright State men’s soccer team opened conference play Sept. 8 when it visited the unbeaten Norse of Northern Kentucky University. The Raiders fell behind early in the match, but came back to tie late, and would go on to win the match in overtime. The match began on a rain-soaked evening, and the weather conditions were a factor throughout Saturday’s match. The Norse got off to a fast start, mounting a steady offensive attack. Conner Probert put NKU on top in the 10th minute off of a backheel feed from Alex Greive inside the box. The Norse attempted 10 shots before the halftime whistle. Only two of these shots were on target, with junior Joel Sundell saving the only other. The Raiders spent much of the first frame in the defensive half of the field, managing two shots with one on frame, and entered the locker room trailing by one. The Raiders flipped the switch in the second half of the match, controlling much more of the offensive flow of the game. Even with a much more potent offensive attack, the Raiders were unable to put the final touch on the goal for much of the second half. In the 87th minute, a reckless challenge from NKU’s Abdul Kooistra inside the 18-yard box earned him a yellow card, and gave the Raiders a penalty shot late in the match. Stefan Rokvic stepped up to the spot late in the match, and with the pressure on, he buried the ball in the back of the net. The two teams entered extra time as the rain continued to pour down, and the first overtime period came and went with only one shot between the two teams. Five minutes after the teams switched ends for the second overtime period, the Raiders earned a corner kick, and Deri Corfe lofted a shot over keeper Jim Barkei and into the back of the net to give Wright State the victory. The Raiders will return to Alumni Field at 7 p.m. Tuesday, Sept. 18 to host Eastern Illinois. For more information on the Wright State Raiders visit www.wsuraiders.com.